MAVR & ELT: A Match Made In Heaven ? 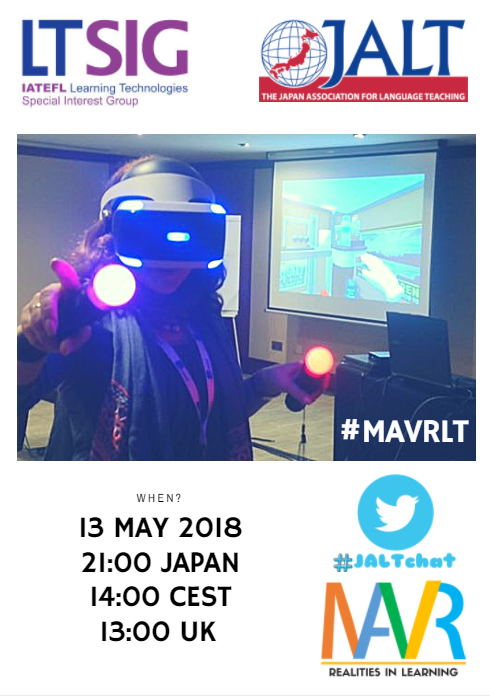 The Japan Association For Language Learning (JALT) is joining forces with the LTSIG on 13 May to discuss mixed, augmented and virtual reality in ELT on Twitter, using the hashtag #MAVRLT. – What is MAVR and what has it got to do with language teaching? – AR, VR, and MR: How are they different? – How can we use MAVR to teach languages? – What are your MAVR recommended apps/devices? See the video below for a brief view of what this collaborative Twitter chat promises to cover. You can also log into the #MAVRLT Tweet Chat event page on Facebook to keep posted and join the event.